All details related to an article study may not be completely mentioned here. The detailed information related to format is given in the article template file. If there exist some inconstancies between the information given here and template file, then the template file should be taken into consideration. In order to prepare the studies being appropriate to the format rules of the journal, the template file should be used. (For Manuscript EPOD_Template ; for collected works EPOD_Review). If the writing process was made with another file, the content should be readjusted as template form. Fonts: Text should be written in 11 font size, Times New Roman, and one space. Text should be one column. Paragraph Format:. The space before and after the paragraph should be 6 nk and line spacing should be one. Authors’ Name: Authors’ name should be written 11 fonts, last name is uppercase and center aligned. If there are more than one authors their names should be ordered with respect to their contribution to the study. Author(s)’ work addresses with city and country information, e-mail addresses and academic titles should be specified with marks (*) which are matched with authors names and should be given as a footnote in the end of the first page. If the study was presented in an academic event, it is needed to put a mark (*) on the title and to written event’s name, date and place on the footnote in the end of the first page. If the study was supported by any research institution or fund, it is also needed to put a mark (*) on the title and to written the name of the institution, project id and the date of the project completed. If the study was produces from a thesis, it is needed to put a mark (*) on the title and to written the thesis’ name, advisor’s name and the date of completion. Whole information placed on footnote should be written 9 fonts. (Please see the template). Abstract: Studies can be written both in English and in Turkish. In the beginning of the study, there should be English and Turkish abstract. Abstract should include brief and clear information about the purpose, method and results of the study. It should be written 10 fonts, single space, two-sided aligned and should not exceed 250 words. There should be no reference in abstract text. After abstract text, there should be 3-5 keywords in each language. Keywords should be written in lowercase and separated each other with a comma (,). There should be a single space between keywords and introduction. For foreigner authors it is acceptable to translate the abstract, keywords and titles to the Turkish language by using google translate. It will be corrected by the editors. Main Text: Main text should start after abstract with the ‘INTRODUCTION’ title. METHOD, RESULTS, CONCLUSİON and DISCUSSION parts should not have started from the new page, they need to be written right after the previous part ended. Both qualitative and quantitative studies should include Introduction, Method, Results, Conclusion and Discussion parts. Method section need to include sample/working group, data collection procedure, and data analysis sub sections. Model sub section will be included if an authentic model was used in the study. Collected works should present the problem, analyze the related literature effectively, focus on gaps and contradictions in the literature and mention the steps of the solution. In the other studies, there may be some changes with respect to the type of the content but the sub sections should not be designed in such a way that makes hard to understand the concept for the audience. Main Section Headings: The main section headings should be written without numbering, 11 fonts, left aligned, initials are uppercase. In the text below the title, there should be no paragraph indentation. Second Level Heading: They should be written 11 fonts, left aligned, italic, initials are uppercase. There should be single space blank from the previous paragraph. Third Level Heading: They should be written 11 fonts, left aligned, italic, initials are uppercase. There should be single space blank from the previous paragraph. Fourth Level Heading: They should be written 11 fonts, left aligned, italic. In the end, there should be a colon and text should continue from there. There should be single space blank from the previous paragraph. The elements like tables, figures, pictures graphics etc. should be placed inside the text. They should not be given at the end of the study. Figures: Figures should be numbered by digits. Figure title should be given with figure number below the figure and should be written left aligned, and initials are uppercase. They should not be written bold or italic. After the figure number put a full stop and then write the name of the figure. The space between figure and the figure title should be single line space. If there is a reference, it should be given in parenthesis below the figure. Figures should absolutely be addressed in the text. Tables: Tables should be numbered by digits and table title should be written above the table, left aligned, and initials are uppercase. Table title should not be written bold or italic. After the table number put a full stop and then write the name of the table. Content of the table should be written 9 fonts. The space between table and the table title should be single line space. Tables should absolutely be addressed in the text with table number. Tables should be place in the or following pages which they addressed in the text. Related notes and sources should be indicated below the table with ‘notes’ or ‘sources’ remarks. In tables and figures 9 fonts Times New Roman character will be used. References should be placed in the end of the article and before the appendices (if exists). They should be written with respect to APA 6 Publication Manual format. For further information, please visit; http://www.apa.org. References should be written in 10 fonts including the title with single space and in alphabetic order. The paragraph intends should be 1,16 inch to right. As shown, the second and following lines of each reference should be aligned 1,16 inch to right. Two Authors: “Crocker and Algina (1986)………”; “According to Crocker and Algina (1986)”; (Crocker & Algina, 1986)”. Three or more Authors: Authors’ last names is given in an order same as the original article. “(Demerouti, Bakker, Nachreiren, & Schaufeli, 2000)”. If the same study will be cited more than one , then only first authors last name will be written; for other authors use et al. expression “(Demerouti et al. 2000)”. Institutions: In the first citation the whole name of the institution and the abbreviation of its name and the date should be written. “(Türk Standartları Enstitüsü [TSE], 1999)”. If there are two or more citations from one author in the same year, then a, b, c.. letters are added to the years like “(Berke, 2002a)”; “(Berke, 2002b)”. Books in Turkish Turgut, M. F. ve Baykul, Y. (2010). Eğitimde ölçme ve değerlendirme. Ankara: Pegem Akademi. Books translated to Turkish Morris, C. (2002). Psikolojiyi anlamak (Çev. A. Erkuş, A. D. Batıgün ve B. Ayvaşık). Ankara: TPD Yayınları. Book chapter in English Kane, M. T. (2006). Validation. In R. Brennan (Ed), Educational measurement, (4th ed.,17-64). Westport, CT: Praeger. Book chapter in Turkish Uysal, Ş. (1971). Metodoloji açısından Türkiye’de yapılan sosyolojik araştırmalar ve bir örnek köy araştırması. N. H. Fişek (Ed. ), Türkiye’de sosyal araştırmaların gelişimi içinde (s.139-151). Ankara: Hacettepe Üniversitesi Yayınları. Article in Turkish Acar, T., ve Kelecioğlu, H. (2010). Maddenin farklı fonksiyonlaşmasını belirleme tekniklerinin karşılaştırlması: GADM, LR veMTK-OO. 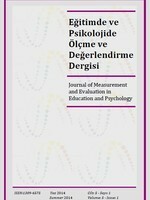 Kuram ve Uygulamada Eğitim Bilimleri, 10(2), 639-649. Thesis in Turkish Acar, T. (2008). Maddenin farklı fonksiyonlaşmasını belirlemede kullanılan genelleştirilmiş aşamalı doğrusal modelleme, lojistik regresyon ve olabilirlik oranı tekniklerinin karşılaştırılması (Doktora tezi, Hacettepe Üniversitesi, Eğitimde Ölçme ve Değerlendirme Anabilim Dalı, Ankara). http://tez2.yok.gov.tr/ adresinden edinilmiştir. Presentation or poster Presenter, A. A. (Year, Month). Title of paper or poster. Paper or poster session presented at the meeting of Organization Name, Location.Beretvas, S. N., & Williams, N. J. (2002, April). The use of HGLM as a dimensionality assessment. Paper presented at the annual meeting of the American Educational Research Association, New Orleans, LA. Appendices: Each appendix should be given separate pages after references. Others: p-value should be given out of the table. There should not be a separate p column in the tables. P values in the text should be written italic. Given numbers in the text should have only two digits after a comma. Frequently used statistical techniques should be given in the text as following way. Variance analysis: ”The main effect of age is significant (F(1,123)=5.43, p<.05)”. While reporting correlation and chi-square number of cases (n) and t; while reporting F multiple comparisons (Like Tukey) degrees of freedom (df) should absolutely be given. While reporting regression analysis Beta values; while reporting factor analysis factor loadings and eigenvalues should be given. These are only examples, for different statistical techniques, the symbols and descriptions should be given appropriately. Please be sure that your text is written grammatically. This part is only for Turkish authors. Extended abstract should have at least 1500 and at most 2000 words. Text should be written 11 fonts, single-spaced. Extended abstract should be written in Turkish and placed above the reference section.